Washington, D.C. – On Friday April 26, 2013, over 1.8 million people sent comments vehemently opposing the approval of a genetically engineered (GE) salmon by the Food and Drug Administration (FDA). The effort was driven by a broad coalition organized over three years ago by the Center for Food Safety and consisting of public interest, consumer, environmental and animal protection groups, along with commercial and recreational fisheries associations and food businesses and retailers. The groups responsible for organizing the over 1.8 million comments included: Avaaz, Center for Food Safety, Friends of the Earth, Food and Water Watch, MoveOn, Organic Consumers Association, Food Democracy Now, Credo, Consumers Union, Just Label It, Farm Sanctuary, Cascadia Wildlands, Earthjustice, American Anti-Vivisection Society, Institute for Responsible Technology, and the Alliance for Natural Health –USA. On Wednesday, 12 Senators led by Senator Mark Begich (D-Alaska) and 21 Representatives led by Congressmen Don Young (R-AK-01), Mike Thompson (D-CA-05) and Jared Huffman (D-CA-02) sent letters to the FDA urging it to halt its approval until their economic, regulatory and environmental concerns are addressed. The Congressional letters come just months after an amendment offered by Senator Begich to the Senate Budget Resolutionpassed by voice vote in favor of the labeling of GE fish. 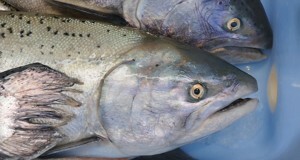 In addition to Congressional attention, the FDA received joint letters from major groups and businesses reflecting broad public opposition to GE salmon. A joint letter was submitted by CEOs of major environmental organizations including American Rivers, the Center for Food Safety, Earthjustice, Friends of the Earth, Food & Water Watch, Greenpeace, Natural Resources Defense Council, Ocean Conservancy and Sierra Club. Led by the American Anti-Vivisection Society (AAVS), 22 animal protection organizations joined a letterto FDA opposing GE salmon, as did a number of religious groups.